I'm working a little backwards here. Although I've shown you bits and pieces of our bathroom remodel, I just realized that I never gave you a complete look into the general design elements going into the space. 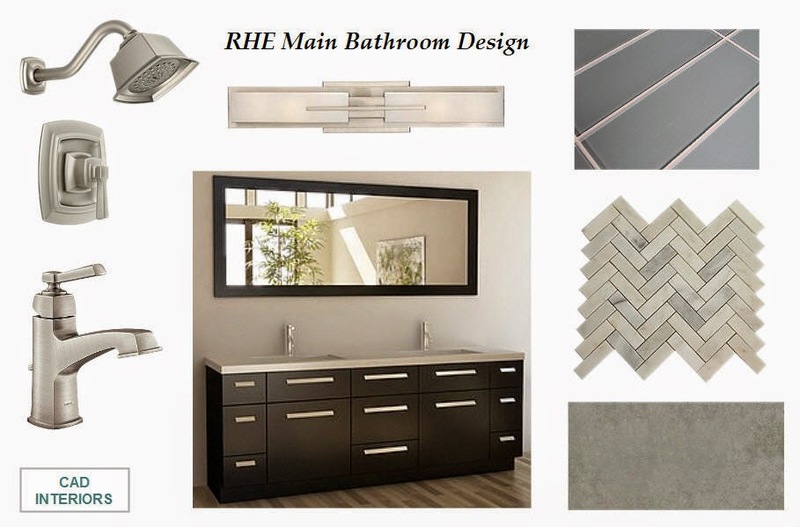 For this bathroom design, I sourced a mix of custom and big-box products to stay within budget and a timeframe. Certain things were not my first choice, but I had to prioritize where to "splurge" to stay within budget. For us, the tile work is where we invested the dollars! I was able to find a 7-foot solid wood vanity online for an excellent price and free shipping (it is very heavy and came in three humongous boxes). We ended up saving $$$$ not having to do custom cabinetry and getting a stone countertop slab. Although my preference was to have vessel sinks, this vanity already came with two rectangular sinks. It has a solid quartz countertop (which is what I wanted), soft-closing drawer mechanisms, and the coordinating framed mirror. All wins in my book. What we saved in the vanity area, we put towards the tiles. Let me tell you, probably 85% of the budget went to the tiles and related labor to install them! We're so close to the finish line. I can't wait to share the "before" and "after" photos once it's done! Thanks for following our home renovation journey. To see the guest bathroom renovation we did in 2013, you can click on the links below. That bathroom was a hot mess before we completely gutted it!